A subsidiary of IIFL Holdings Limited, India Infoline Finance Ltd. (IIFL Finance) is a systemically important non-deposit accepting non-banking finance company. The company was incorporated in 2004 as India Infoline Investment Services Private Limited and convened into a Public limited Company in 2007. Today, our large workforce, led by an experienced management team and a strong geographic footprint of around 1,000 branches, addresses the capital needs of under-served markets through our diversified offerings. We have leveraged the increasing credit demand in the country on the back of a well-diversified product offering, healthy funding and capital adequacy. Manappuram Finance was incorporated in 1992 with its registered office at Valapad, in the Thrissur District of Kerala. It is India's first listed and highest credit rated gold loan company and has emerged as a leading non-banking financial company (NBFC). It has over 3200 branches across 27 states of the country. As part of its diversification the company offers has also ventured into foreign exchange services and has also commenced Instant Money Transfer in collaboration with UAE Xchange, Wallstreet and MoneyGram. 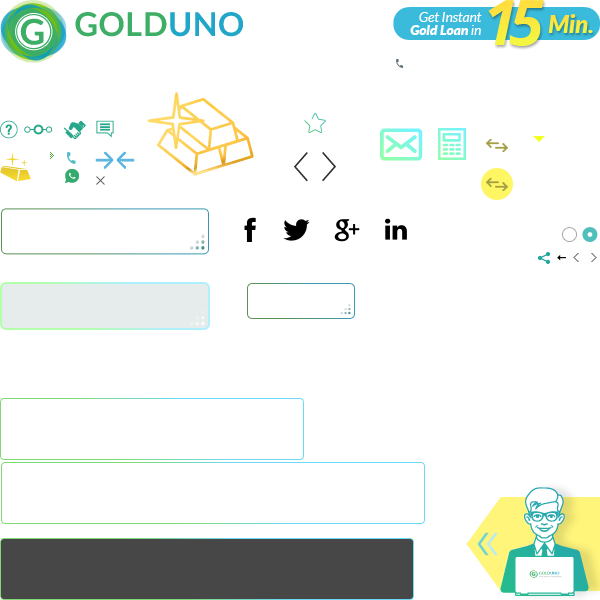 The key feature of its gold loan offer is that customer pays interest only for the exact period of gold loan, and to the exact number of days. Manappuram has different schemes for gold loan for different needs, to suit all income groups. It offers gold loan up to One Crore rupees. State Bank of India is an India Public Sector Bank and Financial Services company with International presence. It is the largest bank in India and is government-owned corporation headquartered in Nariman Fort, Mumbai, Maharashtra. SBI provides a range of financial products and have over 18,354 branches in India and 191 branches spread across 36 countries. Incorporated in June 2017, Fincare Small Finance Bank (Fincare SFB) has been formed from the conversion of Disha Microfin Limited (Disha Microfin), an NBFC-MFI. Disha Microfin was one among the 10 recepients of the ‘in-principle’ approval from the Reserve Bank of India (RBI) in September 2015, an approval granted to select NBFCs and Microfinance Institutions to set up Small Finance Banks with the objective of further financial inclusion. At Fincare Small Finance Bank, we aim to transform banking by making our products simple, processes automated and convenient, and decision and transactions instantaneous for all our customers. Powered by Technology, Fincare SFB has set a vision to the first of its kind ‘Rurban’ Bank catering to the needs of the base of pyramid, mass retail and micro & small enterprise segments and ushering them into the era of Smartbanking. Fincare has different schemes for gold loan to suit different requirements of the customer. Muthoot Finance Ltd. is one of the largest gold financing company in the world. In addition to financing gold transactions, the company offers foreign exchange services, money transfers, wealth management services, travel and tourism services, and sells gold coins at Muthoot Finance Branches. The company's headquarters are located in Kerala, India, and it operates over 4,400 branches throughout the country. The target market of Muthoot Finance includes small businesses, vendors, farmers, traders, SME business owners, and salaried individuals. DCB Bank Ltd. (Formerly Development Credit Bank Ltd.) is a private sector scheduled commercial bank in India. It has a network of 160 branches and 370 ATMs in the country. It offers products to individuals, small and medium businesses, rural banking and mid corporates across its branch network. ICICI Bank is India's largest private sector bank with current network of 4,050 Branches and 13,082 ATM's across India. ICICI Bank offers wide range of products to corporate and retail customers. Some of the advantages of applying for an ICICI Gold Loan are : lower interest rates, No EMI, minimum processing, quick disbursal and trained professional. Axis Bank Limited (formerly UTI Bank) is the third largest private sector bank in India. Although classified as a private sector bank. The bank offers financial services to customer segments covering Large and Mid-Sized Corporates, MSME, Agriculture and Retail Businesses. Axis Bank has its registered office at Ahmedabad. The Bank had a network of 2402 branches and extension counters and 12922 ATMs. Axis Bank has the largest ATM network among private banks in India and it operates an ATM at one of the world’s highest sites at Thegu, Sikkim at a height of 4,023 meters (13,200 ft) above sea level. Kotak Mahindra Bank has over 641 branches and over 1,159 ATMs spread across 363 locations in the country. HDFC Bank Limited is an Indian banking and financial services company headquartered in Mumbai, Maharashtra. It has about 76,286 employees including 12,680 women and has a presence in Bahrain, Hong Kong and Dubai. HDFC Bank is the second largest private bank in India as measured by assets. It is the largest bank in India by market capitalization as of February 2016. It was ranked 58th among India’s most trusted brands according to Brand Trust Report, 2015. Oops! Something went wrong. We have made a note and will fix this. Please continue browsing.